On Sunday, 3.7 million people gathered all over France to mourn the lives of those killed in last week’s Charlie Hebdo attack. It was almost a moving collective stand for freedom of expression in the face of terror and fear—except that its most prominent supporters are much greater threats to a free press than terrorism. 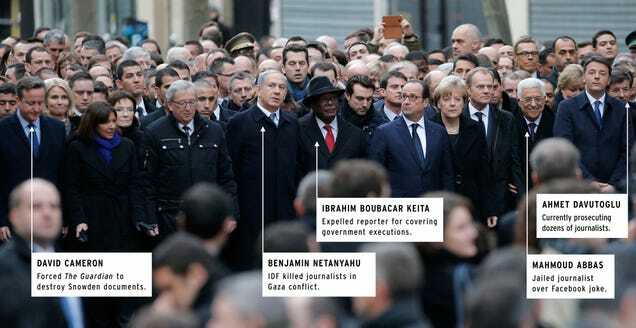 As the non-profit Reporters Without Borders noted on Sunday, and as London School of Economics Middle East Society co-president Daniel Wickham elaborated in a widely disseminated series of tweets, the world leaders given prominent photo-op placement at the Paris rally are not only free-press hypocrites—they’re by any measure worse threats to the world-changing possibilities of a free press than a couple terrorists with guns.